Do you remember Fraggle Rock? 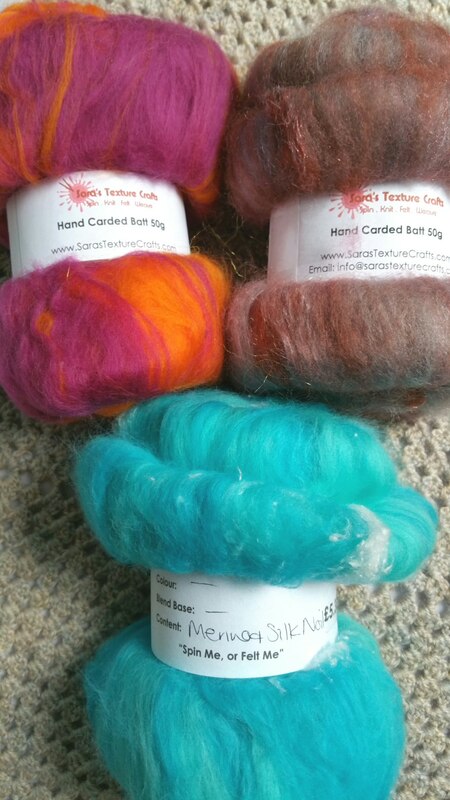 The vibrant colours in these fibre blends brought me right back to the adventures of these childhood companions! I challenge you to feel anything other than happy when looking at these colours. The oranges of Red’s amazing, expressive hair, the purple of Gobo, the blue of Mokey – truly a noble race! 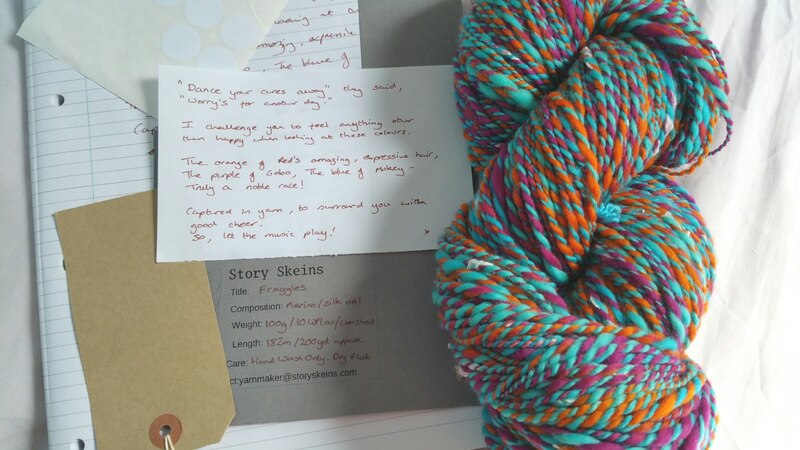 Captured in yarn to surround you with good cheer. So, let the music play! Length: 182m / 200yd approx. I was given these rolags to spin for a swap. There was so much interesting texture hidden within, it was invariably expressed as an irregular textured single in the spinning. The commercial glitter thread sets it off perfectly. Ideas, thoughts, concepts come or arrive or happen or were always there. Sometimes they are fleeting, sometimes more persistent. Some demand to be made. They care not that there is no vocabulary, no construction that can express them. They demand innovation to bring them to life. And the concept that revealed itself to you, which cannot be contrained by conventional lines, may appear differently to each observer. You brought it into being. Now it grows and changes with each interaction. Abstract expression is never static. Weight: 100g / 10 WPI av. / Worsted thick and thin. Length: 219m / 240yd approx. Fibre: Puni rolags of merino, mulberry silk, alpaca and angelina. This gorgeous, soft, squishy yarn was inspired by the May cherry blossom in the local park. 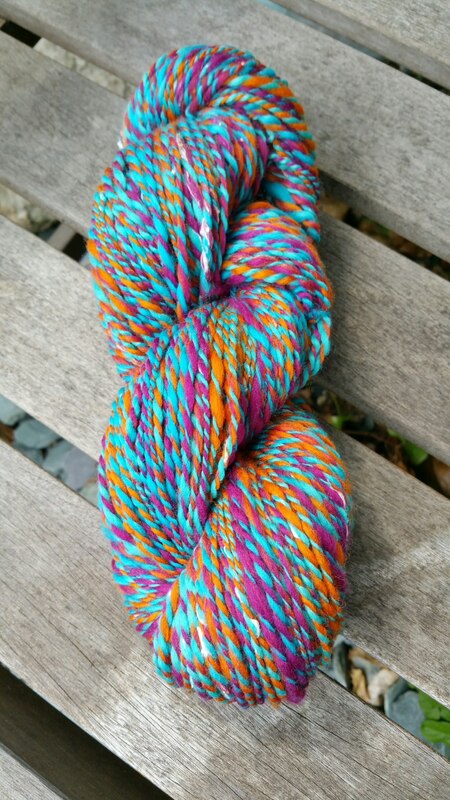 It is a 3-ply yarn and each single has a different composition. Two singles were spun thickly and with lots of texture to reflect the ragged blossom and stamen seen in the cherry flowers. One is white organic Falkland with highlights of pale pink merino. 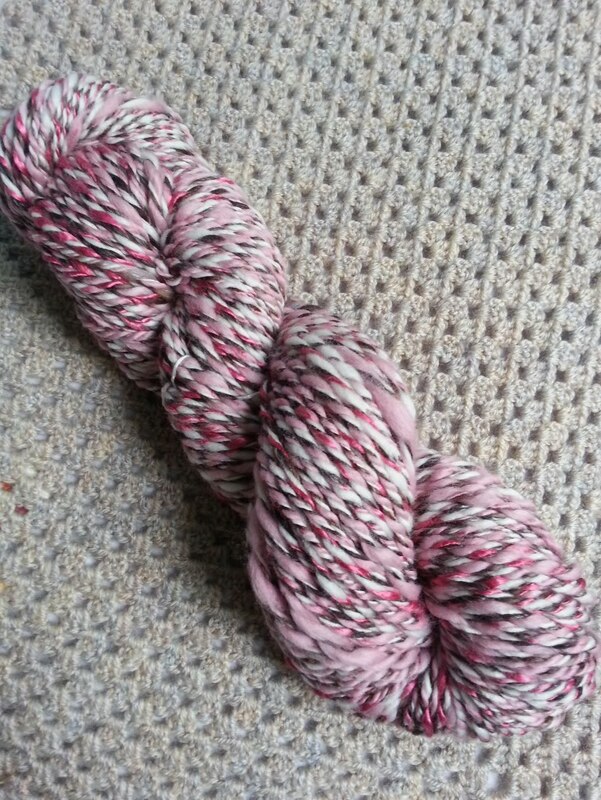 The second is pink merino with highlights of cherry-coloured mulberry silk. The thinner, worsted spun single representing the dark cherry bark is made from 70/30 merino/silk blended tops in shades of brown. Spring’s signature sight: the pinky-white clouds of the cherry tree. Delicate pastels cluster around the dark, twisting bark support. Get close up and the petals reveal all the deep colour and ragged texture of cherries-in-the-making. It won’t be long until they shed their coats, celebrating with nature’s own confetti the progression to summer. Length: 135m / 148yd approx. Fibre: Organic Falkland, 21 micron pale pink merino, strawberry mulberry silk, 70/30 merino/silk in browns.